Baked Beans, originally uploaded by Seligmans Dog. In a pinch, we eat Bush's Baked Beans. Not bad, but I hate the fact they're fat free. Fat free means they unnaturally remove the fat and add a shitload of sweeteners to get the right characteristics. In the process, they make a calorically-dense bean because they want to claim fat free. Bush underestimates the consumer. Beans need fat. And, they shouldn't be as sweet as candy. I made a small batch for (hot)dog night a few days ago. Pretty easy. Ever since Andrew told me of Paula Wolfert's Slow Mediterranean Kitchen, I've used my oven @ 200F overnight as a slow cooker. Ovens are so well insulated, it barely kicks on to maintain 200F. I used this to make my most delectable baked beans the other night and they were yummy. Cook a couple strips of bacon slowly (in ovenproof cookware) to render the fat. Eat bacon and drift into a momentary haze of ecstasy. In the hot fat, saute onion, pepper and celery, dump in 1/2 pound great northerns dry, add parsley, dry mustard, brown sugar, worcestershire (did I spell it right? ), salt (ca. 2 t), pepper, ketchup and place in 200F oven for about 10 hours. Toss in fridge the next morning and reheat while dogs are cooking. Serve. This preparation is ideal eaten near room temperature. Not too sweet or tangy. Vary quantities of ingredients to suit your taste. I love baked beans! I make mine with enough chipotle to give it a very subtle hint of spice in the back of your tongue. I might have to make some this weekend. Looks great-if you want to cook more, just add some beer (and maybe some tomato paste). 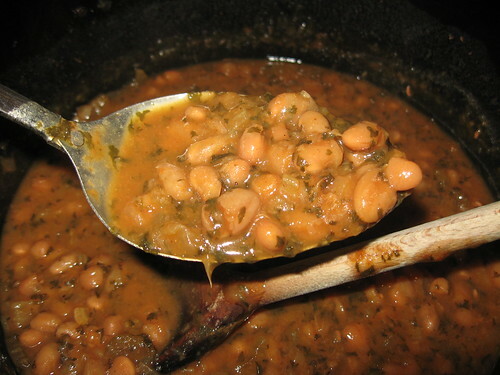 I agree that, when properly prepared with pork fat, baked beans are magical. The simplest posts bring the best comments. Chipotle, one of my favorite chilis will be a good addition. Also, I like the beer and paste option instead of the sweeter catsup way to add tomato. MMMMnn beans, the magical fruit!